Human beings are wired to respond to stories, and we remember things that have an emotional impact on us. Think about it. We can watch an emotionally charged story on the news and remember it for weeks or even months. The same is true when writing a book. When you write your book, there’s a nonfiction writer tool you can use to impact the reader. It affects them on an emotional level, so they will remember what they read. How do you do that? Well, it’s not so complicated. One way to impact your reader is to bring them in close, to make them feel like they’re right there in the room with you. 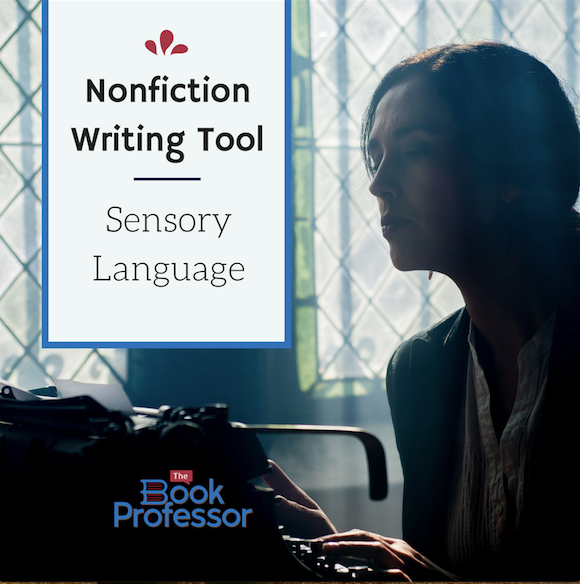 You do that by creating scenes that use the nonfiction writer tool of sensory language. In this passage, you find four of the five senses: She told me–hearing; throat clamped tight and hot tear–feeling; she smiled–sight; she whispered–hearing; salted my upper lip–taste. The only sense not included is the sense of smell. Sensory language punches up your writing and engages the reader. It breaks up the monotony and helps the reader to visualize the scene, so they can experience it. Take a look at the two passages below, and notice how sensory language makes a difference. 1. Becky called me and said that something terrible had just happened. She wanted to talk about it, so I asked her to meet me at the grill on the ground floor of my building. It was almost noon, and I was hungry, so I asked her if she wanted something to eat. A piece of red hair – I Love Lucy red hair – escaped from behind her ear, and she slicked it back without taking a breath. My watch beeped twelve o’clock, but she yammered on. The grilling onions made my stomach lurch. I hadn’t eaten breakfast. 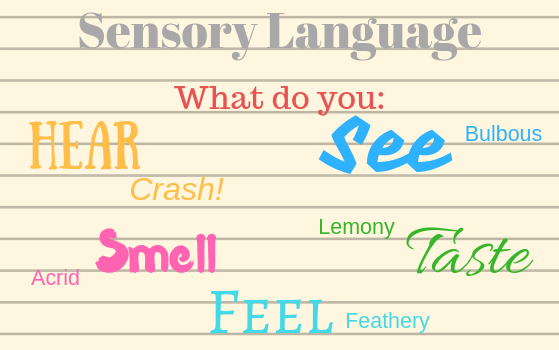 Sensory language is a nonfiction writer tool that is easy to incorporate. All you have to do is describe what you hear, what you smell, what you see, what you feel, and what you taste. Drop those elements in a scene and watch your writing come alive! What about you? Are you ready to put sensory language to work? If you or someone you know has always wanted to write a book, reach out to us, and we can help make it happen!